A selection of props & photos from the Eddy & Eleanor Johnson Collection. 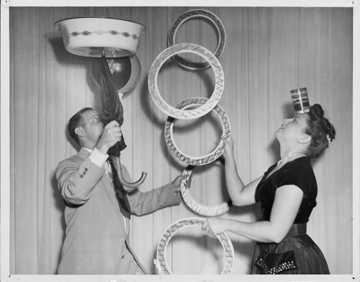 Edwin G. "Eddy" Johnson (1922-1999), one of the eight founders of the International Jugglers' Association in 1947, worked professionally and semi-professionally through the years, both as a solo performer ("Eddy Easy") and in an act with his wife, Eleanor Johnson ("Eddy & Ellie"). He was involved with the IJA throughout his life, serving as an officer in the 1950s and organizing the 1952 convention in Altoona, Pa. (He was designated an Honorary Life Member of the IJA in 1995.) A graduate of the Wharton School of the University of Pennsylvania, he pursued a career with the federal government, ran a travel agency in his retirement, and served 16 years in the Pennsylvania state legislature. 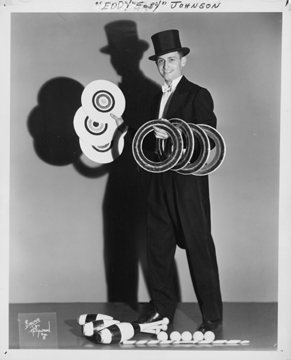 Upon his death in 1999, Eleanor Johnson donated his props and collection of photos to the IJA at his request. Photographer: studio photo - Bruno of Hollywood, New York, N.Y. This undated letter from Eleanor Johnson, widow of Eddy Johnson, accompanied the donation of props and photographs received by the IJA archives sometime after May 1999.